If you happen to live in a home without ductwork or have converted a sizeable area to living/working space, you’ll appreciate this multi-split unit. It can provide cooling for those hot summer days and warmth the rest of the year while temperatures remain above 5°F. 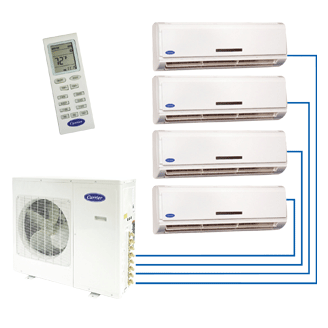 As a multi-split you can use up to four indoor highwall units supported by just one efficient, outdoor variable-speed compressor unit. For quiet comfort in a large space application, it can’t be beat.